Funda Nenja's township Dog Training Initiative is making a huge difference in the community, not just helping owners with their dogs, but building up awareness on animal's needs and giving hope and passion to a community. If you would like to know more about the wonderful work these dedicated people are doing, and even get invoved, do read more. These guys really do deserve as much support as we can possibly give them. Incidentially, the founder of Funda Nenja is Adrienne Olivier who runs Puppy Schools in KZN, all of which feature in our Recommended Puppy Schools that we advocate you use. Click here to see what Adrienne offers in these classes. 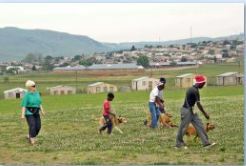 Children arriving at a Funda Nenja dog-training class that takes place in the grounds of Zamathuli Primary School in Mpophomeni, near Howick in the KwaZulu-Natal midlands. “We ARE making a difference – the evidence is reflected in the broad smiles of the dog owners and wagging tails of their dogs each week.” This confidently happy declaration indicates the characteristic enthusiasm to be found at a KwaZulu-Natal township dog training initiative. Using gentle, reward-based methods, young people learn a lot more than dog-handling skills: They also develop close bonds with their dogs and an enhanced awareness of animal welfare. Adrienne Olivier (left), founder of Funda Nenja, watches members of a dog-training class go through their paces in Mpophomeni township. Since July 2009, members of Funda Nenja (“learning with the dog” in Zulu) have been meeting to share interspecies and multicultural communication. 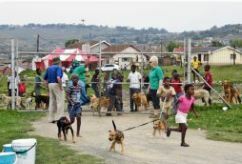 The project now comprises about 70 dogs, their caregivers and a small group of volunteers who meet weekly in Mpophomeni, a poor peri-urban township near Howick in the KwaZulu-Natal midlands. Through caring for and working with their dogs, the mostly young handlers learn self-discipline and responsibilities that contribute to a sense of self-worth, a new-found poise and the development of leadership skills. Several of the more experienced dog handlers have progressed to becoming volunteer trainers themselves, and by leading Funda Nenja classes they pass on their knowledge to newer participants in the programme. Funda Nenja now fields a team that regularly demonstrates dog obedience and handling skills at various public events. 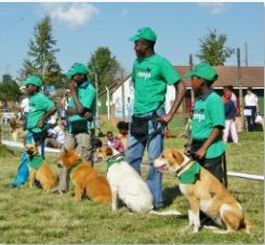 Last year, several Funda Nenja handlers and their dogs entered their first Kennel Union of South Africa (KUSA) dog show and qualified for the Canine Good Citizen award. This was the first time that the often underestimated “township” dogs have competed in a KUSA event. 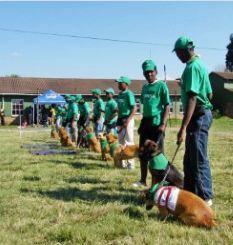 In January 2012, thanks to the sponsorship of a much needed dog-trailer, a team of five boys and their dogs were able to travel to Gauteng to participate in a fun day fundraiser that was held at Birch Acres Training Club in Benoni. Not only did this event raise much needed funds for Funda Nenja, but the team’s success inspired an enthusiasm that was shared by all at Funda Nenja. Although the team gives polished displays of obedience work, most important is the rewarding bond that develops between the dog handlers and their dogs. All participants at Funda Nenja learn the importance of providing their dogs with shelter, water, regular food and affection, and they learn that dogs return kindness and care with companionship and protection. And it is evident that the dogs benefit too as they become more confident and happier in their relationships with people. Every dog that takes part in the programme is fitted with a collar and lead, and the handler is given training treats, both for the afternoon lesson as well as for training at home during the forthcoming week. Participants are given containers for their dog’s food and water, and in winter, a blanket for each dog. 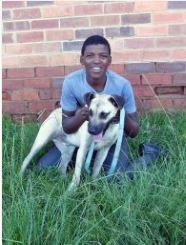 Funda Nenja is a registered non-profit organisation, and it relies entirely on donations to fund its work, and on its volunteers, including those who run the weekly township dog-training classes. Funda Nenja has a close relationship with the local uMngeni SPCA. Every Friday afternoon, SPCA field officers visit the Funda Nenja training sessons that take place at the Zamathule School grounds, to collect dogs and other animals requiring medical attention to take to its clinic in Howick. Both organisations assist with the control of parasites in dogs, and promote a sterilisation campaign. In addition, the SPCA’s outreach clinics provide free rabies vaccinations. Their combined initiatives have resulted in many more people bringing their animal welfare concerns to the SPCA and to the Funda Nenja volunteers. A second branch of Funda Nenja is being established at eManzimtoti, just south of Durban. Led by Lee Lewis it has been going since October 2011, with about six regular volunteers. The group meets every Saturday morning with, on average, 35 dogs attending. The branch has applied for NPO registration and volunteers are working hard to raise funds to enable its work to continue. The new branch had its first demo at the popular Highlands Gathering in eManzimtoti in April this year. Adrienne Olivier, Funda Nenja’s founder, believes that learning to care for an animal is a step towards becoming a caring adult and a positive influence in the community. Funda Nenja’s vision is to use dog training as a vehicle to develop respect and compassion for all living things. The on-going project not only enhances the lives of the people and dogs directly involved, but it also has a ripple-effect on the wider community and on animal welfare generally. Or as Funda Nenja volunteers put it, it is “practical animal welfare education happening at grass roots level”. 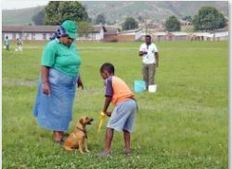 Volunteer trainer Winnie Sangcosi (left) watching Qiniso give his dog Thombazani a treat. In the background, volunteer Alex Zuma stands by with fresh water for the dogs. As no water is available on site, containers of water are transported to the training venue each week by Funda Nenja volunteers. 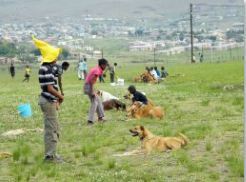 The Funda Nenja team starting their demo at the nMngeni SPCA Township Dog Show and Clinic in Lidgetton on 13 May 2012. The team comprises (from close to far in the picture): Thobani and his dog Hayley, Themba and Hoppie, Tom and Bolt, Sphamandla and Spoton, Andile and Poody, Siyabongo and Snoopy, Mazisi and Spooky, Sphesihle and Chocolate, Bheko and Smoothies. 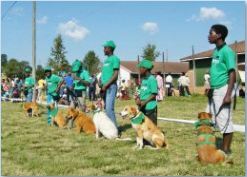 The Funda Nenja demo team at the 2012 uMngeni SPCA Township Dog Show and Clinic, Lidgetton. From left: Andile & Poody, Sphamandla & Spoton, Mazisi & Spooky, Thobani & Snow White, Sphesihle & Chocolate, Bheko & Smoothies. You may also be in a position to donate a portable gazebo that is needed to offer protection from the sun on hot days. A fun way to help, is to “Give a Good Feeling” in the form of a Funda Nenja gift card. Next time someone has a birthday or celebrates a special occasion, you may like to give a donation to Funda Nenja on their behalf. Funda Nenja will then send the recipient a personalised e-card thanking them for their gift to the children and dogs of Mphophomeni, who will be delighted at their kindness. Taking a break in the shade during an afternoon Funda Nenja training class on an extremely hot day are Nhlakanipho Majola and his exuberant dog Max. Tom Vilakazi, eye catching in his novelty hat, asks his dog Bolt to lie down and “stay” until he calls his dog to come to him during one of Funda Nenja’s dog-training classes.